23- The effect of time-of-day and sympathetic α1-blockade on orthostatic tolerance – Lewis et al. 24- Alpha-1 adrenergic receptor control of the cerebral vasculature in humans at rest and during exercise – Purkayastha et al. 25-The functional role of the alpha-1 adrenergic receptors in cerebral blood flow regulation – Purkayastha et al. 26- Cerebral oxygenation following epinephrine infusion – Steinback et al. 14- Impact of phenylephrine administration on cerebral tissue oxygen saturation and blood volume is modulated by carbon dioxide in anaesthetized patients – Meng et al. 16- Effect of age on exercise-induced alterations in cognitive executive function: relationship to cerebral perfusion – Lucas et al. 19- Effect of head rotation on cerebral blood velocity in the prone position – Højlund J et al. 20- Face cooling with mist water increases cerebral blood flow during exercise: effect of changes in facial skin blood flow – Miyazawa et al. 21- Cerebral blood flow and cerebrovascular reactivity at rest and during sub-maximal exercise: Effect of age and 12-week exercise training – Murrell et al. 22- Differential blood flow responses to CO₂ in human internal and external carotid and vertebral arteries – Sato et al. Today, I would just like to add some details regarding differences between static and dynamic cerebral autoregulation. In a previous post about cerebral blood flow, I stated that the mechanism known as static cerebral autoregulation considers the net change in cerebral blood flow following the manipulation of cerebral perfusion pressure under steady state. Static cerebral autoregulation is often studied with drugs that increase (phenylephrine) or decrease (sodium nitroprusside) arterial pressure. As demonstrated by the figure below (from Tiecks et al. ), it represents the long-term steady-state control of brain blood flow. 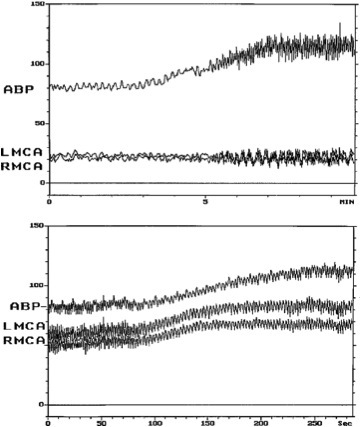 In that example, steady-state cerebral blood flow (LMCA/RMCA in the figure) stays relatively constant following an elevation in arterial pressure when static cerebral autoregulation is intact (top panel). However, cerebral blood flow increases with arterial pressure when static cerebral autoregulation is affected (down panel). Still, the relationship between arterial pressure and brain blood flow is not completely flat and some investigators recently challenged the concept of static cerebral autoregulation. Indeed, Lucas et al. didn’t observe constant cerebral blood flow (and oxygenation) when decreasing (with sodium nitroprusside) and increasing (with phenylephrine) arterial pressure in healty subjects with intact cerebral autoregulation. 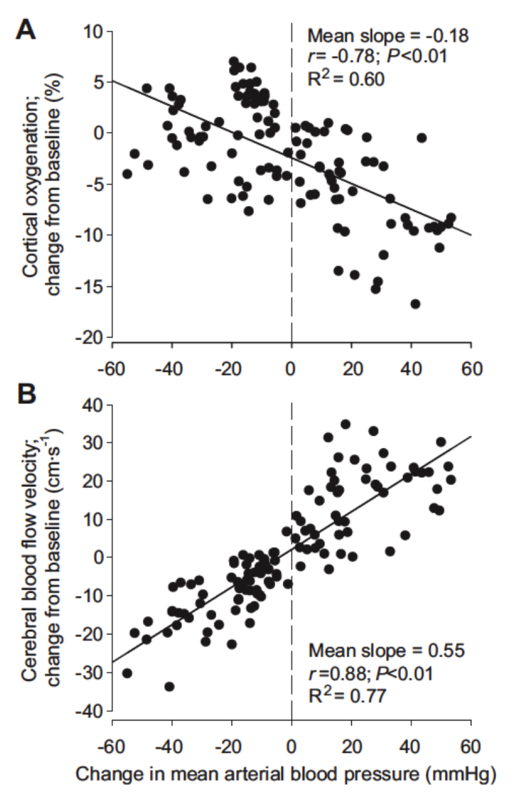 The figure below shows cortical oxygenation (measured by near-infrared spectroscopy;A) and cerebral blood flow velocity (measured by transcranial Doppler; B) changes with the modulation of mean arterial pressure. These observations suggest that cerebral blood flow and oxygenation are not independent of changes in arterial pressure. However, further studies are needed to support this data since, as stated by Immink et al. in a letter to editor regarding this work by Lucas et al. New data of the last 2 decennia made us aware that determination of the blood pressure-CBF relationship in humans continues to remain difficult, because deliberately induced changes in blood pressure are inevitably accompanied by changes in flow and resistance that each independently have the potential to modify CBF and oxygenation. This being acknowledged, sudden changes (elevation/reduction) in arterial pressure are transmitted directly to the brain circulation under usual circumstances, but brain blood flow tends to return to its baseline value within a brief period of time. The fast mechanisms that permit the restoration of brain blood flow after acute changes (elevation/reduction) in arterial pressure are referred to as dynamic cerebral autoregulation. The latter is often evaluated from spontaneous fluctuations in arterial pressure and cerebral blood flow velocity at baseline and during different interventions (such as head-up tilt, the Valsalva maneuver, or standing up). It can also be assessed using a sudden drop in arterial pressure with the thigh cuff method. Some evidence suggests that dynamic cerebral autoregulation is better at responding to an augmentation vs. a reduction in mean arterial pressure. In upcoming posts, I will discuss the parameters (such as PaCO2, temperature, etc.) and diseases (such as hypertension, diabetes, etc.) influencing cerebral autoregulation. 9- Cutaneous vasoconstriction affects near-infrared spectroscopy determined cerebral oxygen saturation during administration of norepinephrine – Sørensen et al. 10- Differential effect of phenylephrine and ephedrine on cerebral haemodynamics before carotid cross-clamping during carotid endarterectomy – Pennekamp et al. 11- Early cerebral perfusion pressure augmentation with phenylephrine after traumatic brain injury may be neuroprotective in a pediatric swine model – Friess et al. 13- Cerebrovascular reserve: The link between fitness and cognitive function? – Davenport et al. 7- Cholinergic control of the cerebral vasculature in humans – Hamner et al. 8- Influence of posture on the regulation of cerebral perfusion – Gelinas et al. Dear readers, since some of you may be interested in cerebrovascular physiology (even you Isis) but don’t have necessarily the time to scan the literature (or don’t have PubMed email alerts for articles related to that topic), I have decided to start a new section here at Le Physiologiste where I will highlight new papers related to cerebrovascular physiology that I have read. I hope that this will be of help for you to follow that literature ! 1- Impaired cerebrovascular autoregulation in patients with severe sepsis and sepsis-associated delirium – Schramm et al. 2- Disassociation of static and dynamic cerebral autoregulation performance in healthy volunteers after lipopolysaccharide infusion and in patients with sepsis – Berg et al. 3- Risks for impaired cerebral autoregulation during cardiopulmonary bypass and postoperative stroke – Ono et al. 4- Effect of the adjunct of carbon dioxide during cardiopulmonary bypass on cerebral oxygenation – Quarti et al. 5- Aerobic exercise training increases cerebral blood flow in postmenopausal women – Akazawa et al. Since 1) the original piece was posted on the older version of Le Physiologiste and, 2) I will discuss a little bit more about the regulation of brain blood flow in the upcoming months, I have decided to repost “Brain blood flow: the basics”. An elevation in brain activity is usually associated with an increase in brain metabolism manifested by an increase in blood flow. There is a precise coupling between brain blood flow and glucose consumption. On the other hand, while a precise coupling between oxygen delivery and uptake is taking place in skeletal muscle for example, oxygen delivery to the brain exceeds its demand. In order to meet the cerebral metabolic demand, blood flow to the brain is controlled by constant adjustments in perfusion pressure (which roughly represents the pressure difference between cerebral arteries and veins) and cerebrovascular resistance. The cerebrovascular resistance in itself is influenced by variations in arterial pressure, i.e. it decreases when arterial pressure is reduced and it increases when arterial pressures elevates. Consequently, brain blood flow remains relatively constant and the underlying regulatory changes are referred to as cerebral autoregulation. In fact, maintenance of cerebral perfusion during physiological challenges, such as standing and exercise, is secured by mechanisms of slow and fast actions. The mechanism known as “static cerebral autoregulation” considers the net change in brain blood flow following the manipulation of cerebral perfusion pressure under steady state. It represents the ability of the cerebral vasculature to maintain brain blood flow relatively stable within a range of mean arterial pressure of 60-150 mmHg (see figure below; MCAv is Middle Cerebral Artery Blood Flow Velocity; CVR is Cerebrovascular Resistance). However, that concept has been recently challenged and will be further discussed in a different post. Although brain blood flow is maintained relatively constant by static cerebral autoregulation, sudden changes in arterial pressure are transmitted directly to the brain circulation under usual circumstances. Still, brain blood flow tends to return to its baseline value within a brief period of time. This short-term control represents “dynamic cerebral autoregulation”. Several physiological stimuli, other than arterial pressure, influence local brain blood flow. The metabolic activity of the brain, arterial gas tensions (carbon dioxide and oxygen) and cardiac output are among the important determinants of brain blood flow. However, the influence of sympathetic nervous activity on the regulation of brain blood flow remains debated to date.The figure below presents the changes in brain blood flow according to different stimuli.